"Forgotten" veterans are finally laid to rest in Utah cemetery. 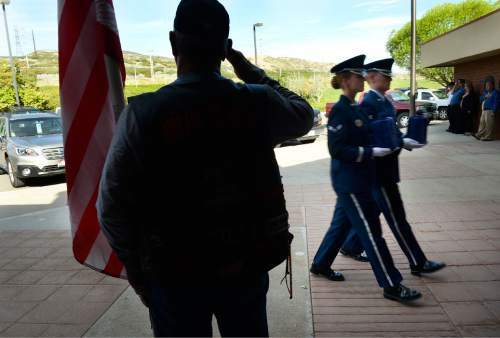 Scott Sommerdorf | The Salt Lake Tribune Two members of an Air Force honor guard carry the remains of two Air Force veterans who were among the 22 whose remains have never been claimed. They were interred in a service at the state veterans cemetery in Bluffdale, Saturday, August 1, 2015. 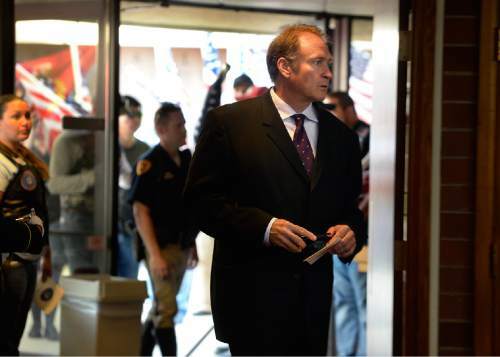 Scott Sommerdorf | The Salt Lake Tribune Utah Senator Mark Madsen, R-Saratoga Springs, enters prior to a ceremony to honor 22 veterans whose remains have never been claimed. They were interred in a service at the state veterans cemetery in Bluffdale, Saturday, August 1, 2015. Scott Sommerdorf | The Salt Lake Tribune The folded flags for 22 veterans whose remains have never been claimed sit during a service at the state veterans cemetery in Bluffdale, Saturday, August 1, 2015. 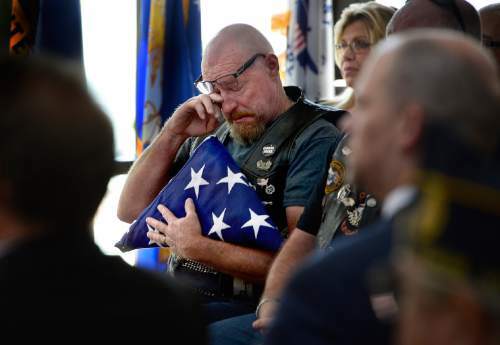 Scott Sommerdorf | The Salt Lake Tribune Veterans salute as some of the 22 veterans whose remains have never been claimed were brought in from a hearse prior to a ceremony at the state veterans cemetery in Bluffdale, Saturday, August 1, 2015. 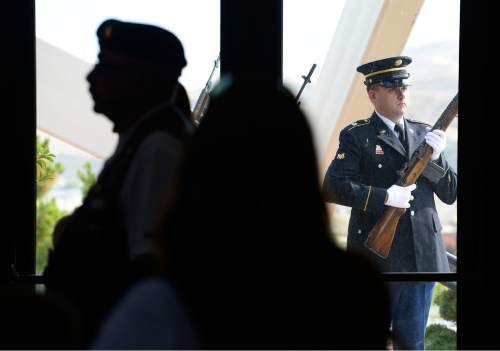 Scott Sommerdorf | The Salt Lake Tribune An Army honor guard performs a gun salute during a ceremony honoring 22 veterans whose remains have never been claimed. They were interred in a service at the state veterans cemetery in Bluffdale, Saturday, August 1, 2015. Scott Sommerdorf | The Salt Lake Tribune "Taps" is played during a ceremony honoring 22 veterans whose remains have never been claimed. They were interred in a service at the state veterans cemetery in Bluffdale, Saturday, August 1, 2015. Scott Sommerdorf | The Salt Lake Tribune Two members of a Navy honor guard during the flag-folding ceremony for the Navy veterans who were among the 22 whose remains have never been claimed. They were interred in a service at the state veterans cemetery in Bluffdale, Saturday, August 1, 2015. Scott Sommerdorf | The Salt Lake Tribune Roger Graves , coordinator of the Missing in America Project / Utah, speaks at a ceremony to honor 22 veterans whose remains have never been claimed. They were interred in a service at the state veterans cemetery in Bluffdale, Saturday, August 1, 2015. Scott Sommerdorf | The Salt Lake Tribune Two members of an Army honor guard carry the remains of two Army veterans who were among the 22 whose remains have never been claimed. They were interred in a service at the state veterans cemetery in Bluffdale, Saturday, August 1, 2015. 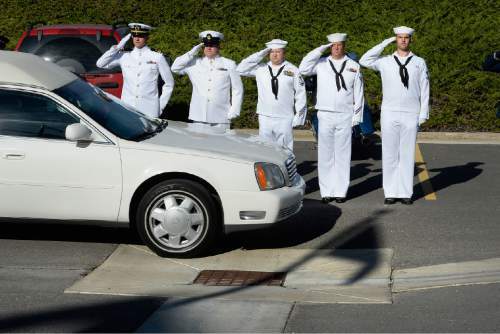 Scott Sommerdorf | The Salt Lake Tribune A Navy honor guard salutes as a hearse carrying the remains of 22 veterans whose remains have never been claimed. They were interred in a service at the state veterans cemetery in Bluffdale, Saturday, August 1, 2015. Also present were honor guards from the Army and Air Force. Scott Sommerdorf | The Salt Lake Tribune Three containers which hold, from left to right, the remains of an Army, Navy and Air Force veteran whose remains have never been claimed. They sit among the 19 others who were interred in a service at the state veterans cemetery in Bluffdale, Saturday, August 1, 2015. 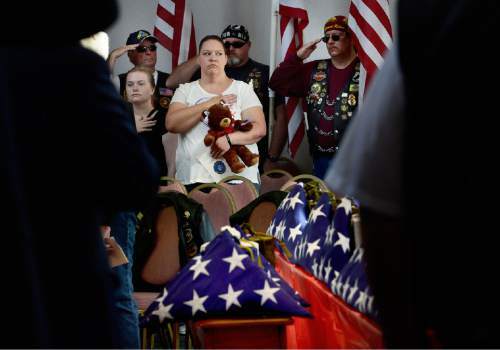 Scott Sommerdorf | The Salt Lake Tribune Two members of an Army honor guard carry the remains of two Army veterans who were among the 22 whose remains have never been claimed. They were interred in a service at the state veterans cemetery in Bluffdale on Saturday. 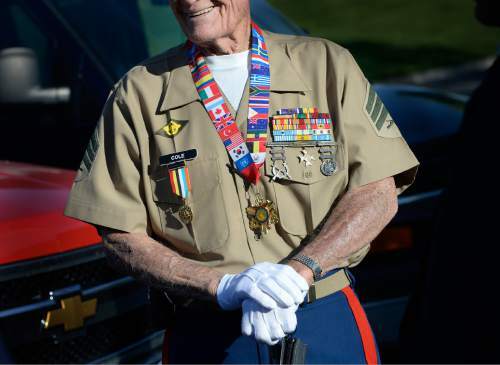 Scott Sommerdorf | The Salt Lake Tribune Marine veteran Sgt. 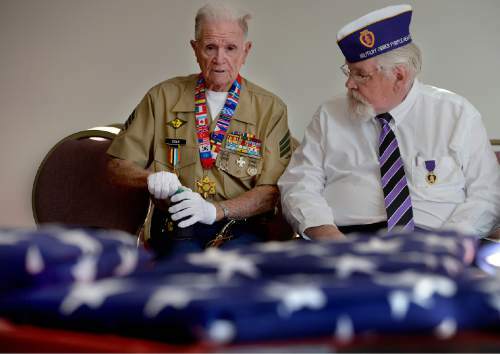 John Cole, left, looks at the 22 flags neatly folded for each of the 22 veterans whose remains have never been claimed. They were interred in a service at the state veterans cemetery in Bluffdale, Saturday, August 1, 2015. Scott Sommerdorf | The Salt Lake Tribune Marine veteran Sgt. John Cole smiles as he awaits the beginning of the ceremony to honor 22 veterans whose remains have never been claimed. They were interred in a service at the state veterans cemetery in Bluffdale, Saturday, August 1, 2015. 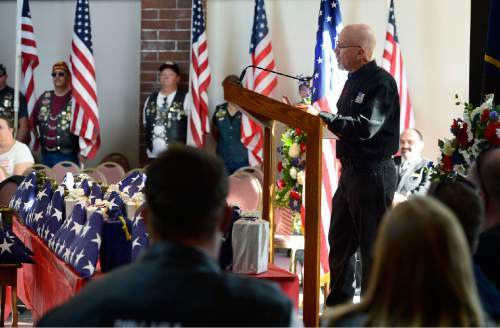 Scott Sommerdorf | The Salt Lake Tribune Jeff Childs of the Patriot Guard Riders reacts as he accepts the flag representing the Army veterans whose remains have never been claimed. Those remains were interred at the Utah state veterans cemetery in Bluffdale on Saturday. Flags were also presented for Navy and Air Force veterans. A total of 22 veterans whose remains are unclaimed. Bluffdale • Twenty veterans who died in Utah, forgotten by or estranged from family and friends, are forgotten no more. On Saturday, their cremated remains and those of two other vets were interred at the Utah Veterans Cemetery and Memorial Park in Bluffdale after a military funeral replete with a wreath-laying, rifle volleys, taps and a separate flag-folding and presentation by honor guards of the three military branches. Some say it&apos;s sad these veterans had no one to claim them, said funeral organizer Roger Graves of Cedar City. "I beg to differ. They have all of us. ... Everyone in this chapel today is their family." "Veterans are all brothers and sisters," said Ogden resident Dennis Howland, president of the Northern Utah chapter of the Vietnam Veterans of America. "They belong to us." Some 100 veterans and friends, elected officials and representatives of military service organizations gathered in the cemetery chapel after the remains were carried by hearse from Deseret Memorial Mortuary in Salt Lake City. Salt Lake City police officers and several dozen riders from Patriot Guard Riders escorted the hearse on motorcycles. At the cemetery, pairs of soldiers, sailors and airmen took turns carrying the urns into the chapel in a solemn procession past the Patriot Guard Riders&apos; flags. 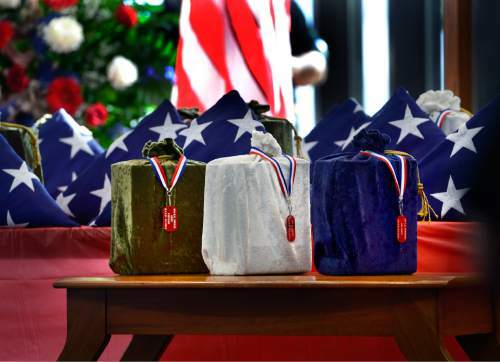 Each urn was covered in a velvet bag  khaki green for the soldiers, white for the sailors and dark blue for the airmen  and adorned with a name-etched dog tag on a red, white and blue ribbon. In the chapel, the urns were placed on a table, each with a folded flag. "There should be no veteran buried without full military honors," said Farmington resident Paula Stephenson, who served last year as the first female commander of the American Legion in Utah. Among those in uniform Saturday was Roy resident John Cole, a Marine survivor of the Battle of Chosin Reservoir during the Korean War. "They are all our comrades and they&apos;ve been forgotten too long," Cole said, tearing up slightly. 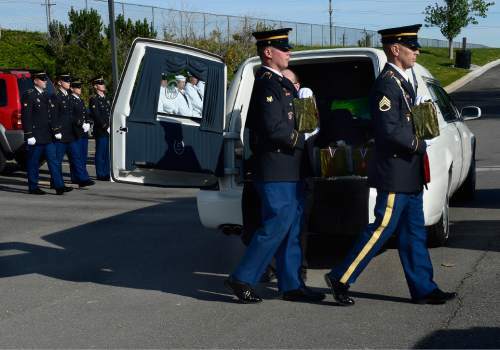 The funeral was organized by the Missing in America Project, which has visited nearly 1,800 funeral homes across the country in recent years, collecting the remains of veterans who outlived their families, or whose families or friends did not want the remains. With Saturday&apos;s interment, it has buried 2,461 veterans whose ashes had been sitting on shelves in temporary urns. 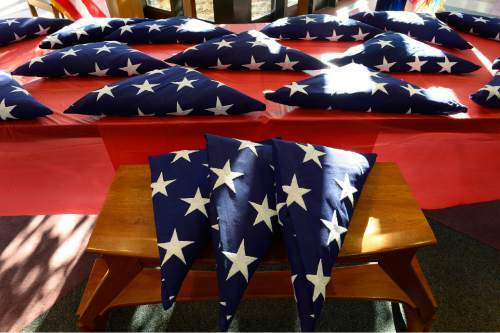 It was the fifth such funeral in Utah, where 87 unclaimed veterans&apos; remains have now been buried. 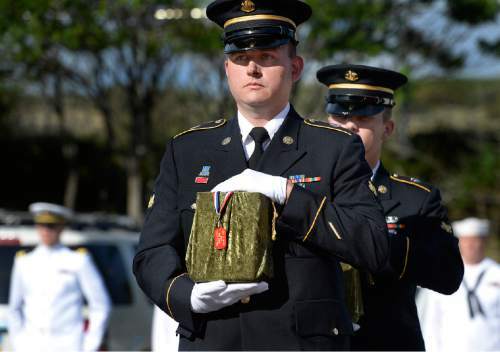 Graves, the group&apos;s Utah coordinator, estimated that 15 percent to 20 percent of the 2 million unclaimed cremated bodies in the United States are veterans. "Our mission," he said, " … is to provide honor and respect for those who served." Deseret Memorial Mortuary&apos;s Scott Dyer, who drove the hearse, said his funeral home did not have any of the remains of those buried Saturday, but it does have those from 20 nonveterans. Typically, a county will pay to cremate those who die without funds. After 90 days, funeral homes can dispose of the remains in a legal manner. Dyer said Deseret typically places the temporary urns in a mausoleum. 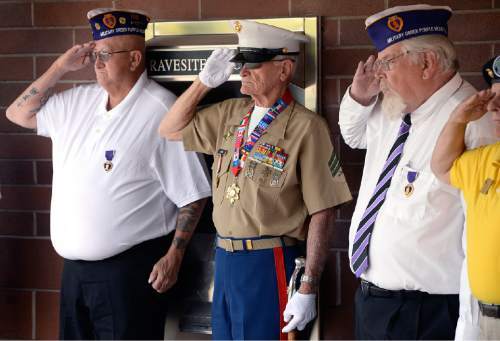 The veterans buried Saturday served in peacetime and in wars  World War II, Korean and Vietnam. The earliest birth date was in 1911 and earliest death was in 1996. The most recent death was earlier this year: Vietnam veteran Brian Gilbert Youell. 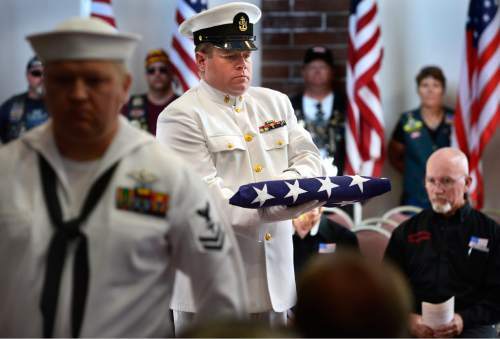 He was the brother of a Cedar City woman who, with her husband, chose to have him and her father-in-law, World War II veteran Hershel E. Hicholson Sr., interred with the "forgotten" veterans. Graves said the Cedar City couple were unexpectedly unable to attend Saturday&apos;s funeral.